Squish, Squash, Bubbly Boo! Rascals make the Fruitiest Chew! If you grew up in the 90’s you surely remember these chewy treats. 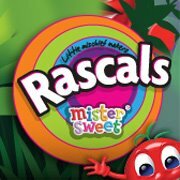 Rascals are back in South Africa thanks to Mister Sweet. These should hit the stores July 16th, 2012 according to the Rascals Facebook Page. Twitter has been buzzing about their return and you can follow @RascalsSA and #RascalsReturn to stay in the loop. Check out this Rascals Ad from 1993. Sure to bring back some memories. Finally got my hands on a packet of rascals, what a joke! They don’t look, smell or taste anything like the original Rascals. Has anyone and Mr Sweet ever tasted a Rascal in their life? Wow, what a major major disappointment. I just moved to White River, Mpumalanga and i know that rascals were brought back in johannesburg. Please tell me where i may find them out here in nelspruit? Just bought a packet…. I’m also VERY disappointed. Was so looking forward to the relaunch, but they don’t taste at all like the originals.